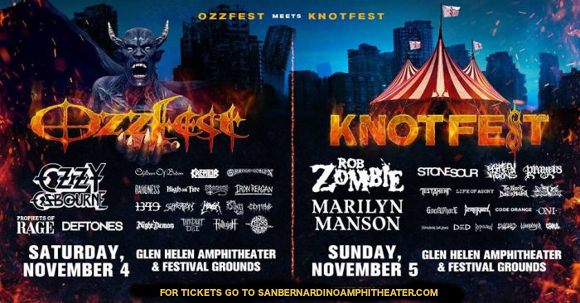 Get ready everyone, for one of the biggest events of last year to take place AGAIN in 2017 – the wondrous joining of the legendary Ozzfest and amazing Knotfest together for their second year running on the 4th and 5th November at the San Manuel Amphitheater!! Get your tickets here for the Knotfest portion of the festival, featuring Rob Zombie, Marilyn Manson, Stone Sour and Eighteen Visions to name a few – but hurry, tickets won’t last long. Started in 2012 by metal band Slipknot, Knotfest has been held at multiple locations around the world since its inception, including Japan! This year marks, unusually, one at which the founding band do not form, though through the appearance of Stone Sour (featuring several members of Slipknot) the essential link is kept very much alive and well. Too right!! Get your tickets TODAY for Ozzfest and Knotfest and get ready for a weekend of one phenomenal performance after another! !